I'm interested in purchasing Senguard to seal my granite countertops, but I would like some information on the process or a PDF of the directions. Not sure if I should do it or have it professionaly done. Anyone can easily apply Senguard or any granite sealer themselves. It's simple, which is why we so highly recommend the SenGuard DIY Marble & Granite Sealer kit to homeowners. SenGuard granite sealer is the most advanced and durable impregnating sealer currently available. It penetrates deeper and forms permanent chemical bonds with the stone, which no other retail sealer does. It was originally developed for factory application to create pre-sealed granite countertops. We found it to be an excellent sealer then as well, but it's pretty expensive to have granite pre-sealed or professionally applied. We thought it was great when a Senguard DIY homeowner kit was developed. Why? Because our website is oriented toward providing the best advice and solutions to the consumer and as noted, sealing granite countertops is not at all difficult requiring about as much skill and expertise as cleaning a countertop or painting a wall. So, even though we really liked the results of Senguard when applied at the factory or professionally we knew that there's no reason to pay $400-$600 for it. With DIY application you get the top product with superior performance and the same results as "professional" application for far far less money. imagine other companies will catch up and put out similar sealers in the future, but for now SenGuard is it. And even though Senguard has advanced chemical technology it is applied the same way any other granite sealer is applied. And you get step-by-step instructions with the Senguard DIY kit in both written form (with pictures) and on a DVD plus all application materials, which is another reason we are fans of the product. It's a simple process, but the instructions make it a no-brainer. The only mistake people make when applying a sealer is letting it dry on the surface, which is easily avoided. And usually the only reason anyone makes this mistake is because someone erroneously told them to apply it and just let it absorb. Impregnating sealers work below the surface, so they need to absorb, but then you wipe the residue off the surface before it dries. When left to dry on the surface the granite sealer will leave a streaky haze. If you'd like more comprehensive information on granite sealers, how sealers work and additional "how to" instructions for sealing granite countertops you can check out our All About Sealing e-book. The granite company neglected to seal the granite before installing. They just came out to seal using SenGuard, but there is one very dark obvious spot after the sealing process. What can I do to fix it myself? It is best to remove all stains prior to sealing granite, but since this countertop was just recently installed the stain shouldn't be difficult to remove using this Stain Removal Poultice product. Just read your comments on SenGuard and the steps for applying. First step is to clean the granite. Can you elaborate on how this needs to be done? A special cleaning product? If the contractor put down an inexpensive sealer in November after the granite countertops were installed do we need to do anything to remove it? Normal cleaning with a granite & marble cleaning spray is fine, but then just prior to applying Senguard you should clean the surface with mineral spirits. This is harmless to the granite, but will remove any gunk and prep the surface. To remove a previously applied sealer, then wash and scrub with mineral spirits a couple times more vigorously than just for prepping the surface as described above. Be thorough to remove any remaining sealer residue. Good article explaining the product & how to use it. How to properly seal a stone surface is a common source of confusion. Can the SenGuard product be applied to a polished granite countertop after a surface sealer type product has already been ineffectively applied? Or must SenGuard be the first application of any sealer product? My newly installed Kashmir White granite fails the water test badly just one week after it was installed and sealed with a water-based sealer (I do not know which one). Yes, the SenGuard Marble & Granite Sealer can be applied over a water-based sealer. It would be best to clean / scrub the surface a time or two with acetone or mineral spirits (neither will harm granite at all) to remove any residue. The real key is that Senguard must be able to absorb effectively, which shouldn't be a problem since you've stated that your Kashmir White granite countetop failed the water absorption test. And that's not too surprising since Kashmir White granite is one of the most porous granites out there. My opinion is that even though many people like the color and pattern, Kashmir just should not be installed (not as a kitchen countertop anyway) because it absorbs like a sponge, stains easily and is difficult to seal well. It also means that Senguard should not have any problem absorbing effectively, and there should not be any issues applying it over a water-based sealer. SenGuard is a solvent-based sealer, however, due to it's unique chemistry it can be applied over any other sealer and to resined countertops as well. The SenGuard granite sealer will certainly be your best bet for durable protection, but you'll still likely have to apply a couple (possibly 3) coats before it is effectively sealed. You'd have to do that with any sealer, but the benefit with Senguard, especially with such a porous stone, is that you get permanent bonding and won't have to re-seal again. Despite what you read, very few granites need re-sealing every year. To suggest that "all" granite must be sealed, and every year at that, is by and large just ignorant nonsense. Now, there are several variables that factor into the frequency for applying a granite sealer but most granite countertops will go 3-5 years, some up to 10, some 15 years and beyond and some granites never need sealing at all. Unfortunately, Kashmir White is one of those "very few" granites that could require re-sealing (with a typical non-permanent granite sealer) every year or even every 6 months in some cases. Obviously, that becomes a chore. SenGuard is currently the most advanced retail granite sealer on the market and once effectively sealed you won't have to mess with it again. So, particularly for Kashmir White it's the only granite sealer I'd recommend. I have Costa rose or Costa Esmeralda rose. Been sealing it monthly because I'm paranoid. Is this product safe for this granite? Safe? Senguard Sealer is made specifically for use on granite and all natural stone. The name or color of your granite is immaterial. There is no reason to apply a sealer monthly. And no reason to be paranoid. Stains in granite are rarely permanent. The reason to apply a sealer isn't because a stain will forever ruin your granite. Stains can be removed. The reason to apply a sealer is so you eliminate the hassle of having to remove stains. Applying a sealer when it isn't needed may result in a hazy film that must be stripped off. The correct procedure is to apply a sealer (multiple coats may be needed for some stones) at one time until effectively sealed and then water test annually until testing shows it needs to be sealed again. Or you can use Senguard, apply until effectively sealed and then never seal again. Senguard is a permanent sealer and does not need reapplication. A countertop company is trying to sell us on the importance of professional SenGuard sealer treatment that protects granite from staining and comes with a 15-year guarantee. A slab yard merchant says that process is really uncomplicated and the consumer can do just as well sealing granite themselves for less money. I'm considering a dark green/black color like Ubatuba granite or Verde Butterfly. Which process do you recommend? First, it may be that neither stone needs sealing because they can both be pretty dense and non-absorbent especially verde butterfly. That's why you should always test for sealing granite countertops (use water or acetone) any stone you intend to seal to determine if indeed it will need or even absorb a sealer. If testing determines that a granite sealer should be applied, then SenGuard is excellent... the best surface stain-protection technology currently available. Now, you can buy the SenGuard sealer kit and easily apply it yourself. The DIY kit comes with both DVD and written instructions and all necessary application materials. The catch on doing it yourself is that you do not get the 15-year warranty. So, you have to consider the likelihood that you'd ever actually need it. My opinion is that you won't ever need the warranty. SenGuard granite sealer forms permanent bonds with the stone. This is a critical difference from all other sealers. Today's "standard" sealer will break down over time particularly from cleaners and other chemical/substance exposure, which is why they need periodic re-application. However, it's quite likely that you will get far more than 15 years of protection from Senguard and it may last a "lifetime." Personally, I don't think there is much advantage to professional application when sealing granite countertops... unless you simply prefer to pay people to do work for you even though you could do it. Chance of staining is minimal. I think the warranty says that SenGuard knows how good their product is, but doesn't offer more warranty than they need to. No other retail granite countertop sealer will perform better or even close to 15 years... see what I mean. And removing stains is easy in most cases and cheap too. So, even if you do stain your marble or granite countertops you can remove the stain using the same simple method any "pro" would use for far less money. Okay... so if it was under warranty then theoretically the person/company that applied SenGuard sealer would have to come and remove the stain for free. But since it is so cheap and easy to do it yourself and the actual risk of a stain is near zero... is it worth paying A LOT for professional application to get the warranty? 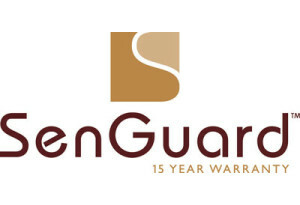 I think it's great that SenGuard sealer offers a 15-year warranty. It shows they believe in and stand behind their product. I also think that the product is so good, the risk so low and the repair so easy that the warranty really doesn't offer you much value. I agree with the slab merchant that sealing granite and/or marble yourself saving the money a pro would charge you is the way to go. The SenGuard Marble & Granite Sealer is safe and easy to use by anyone. No special skills or procedures are required. The only real skill you need is to follow simple instructions provided by the instructional DVD and booklet. Sealing granite countertops is as simple as painting a wall and you should use pretty much the same precautions and preparation. SenGuard has some solvent fumes that quickly evaporate and may produce mild skin irritation for some, so ensure good ventilation, wear eye protection and gloves. It's like working with mineral spirits. No special equipment is needed either to apply SenGuard or any granite sealer. In fact, everything you'll need is provided in the SenGuard Sealer Kit. We are very frank about what homeowner's and DIYers can and can't do regarding natural stone installations. We certainly encourage homeowner's to do as much as possible, but it depends on the type of project. Installing a granite or marble slab countertop is never in any way a DIY job. Installing a tile countertop or floor can be accomplished by a reasonably skilled DIYer. Applying a granite sealer is simple procedure, which is why we encourage homeowner's to do it themselves and save a bunch. What are your recommendations regarding the need to seal or not to seal New Venetian Gold granite that I'm considering having installed in my Master Bath. This will be the only granite in my house, and it will only be approximately 8 square feet total in two separate 4 sq. ft. pieces. Should 15-year Senguard Permanent Bond Granite Sealer be used, which is expensive to buy. Is it possible to buy a few ounces of Senguard Permanent Bond Sealer for 8 square feet of granite if it turns out you advise the New Venetian Gold be sealed? Obviously, I have not performed the water, lemon juice, or oil test on the granite yet since it has not been purchased or installed. Any advice prior to purchase would be appreciated as well. Typically New Venetian Gold granite countertops will take a granite sealer and SenGuard is certainly a top choice. But since we are talking about a natural product, variations can exist and you can't absolutely say yes or no, which is the reason to perform the water test for sealing granite countertops. Testing will tell you for sure if your particular slab have a granite sealer applied. 1. You should always inspect and pick out the exact slab you want installed vs. choosing a color from a sample and letting your designer or installer pick it out. Many people have received a sub-par slab when not picking it out themselves. 2. And the smart move when shopping for stone is to perform the water test (or better) lemon juice test (since this will also test for etching) on the exact slab you intend to purchase. Just have the warehouse break off a small piece (usually not a problem unless the slab is unusually small restricting size of installation) take home and test it. That way you can rule out slabs that are too porous or that etch, which would be problematic in a kitchen. Such concerns aren't as important in a bathroom, but with so many granite and stone varieties and colors to choose from no need to install an overly absorbent slab, etc. Some stones don't need sealing and many will perform very well with application of a granite sealer (once with SenGuard) and periodic re-application. If testing shows you should seal the granite countertop, then I would recommended one of these granite sealers and in particular SenGuard Marble & Granite Sealer. Yes, SenGuard is more expensive, but it's far more advanced and durable and you'll only have to use it once. SenGuard forms permanent bonds, so once your countertop is effectively sealed the first time, you won't have to re-seal like you would with all other granite sealers. I recently purchased and applied SenGuard granite sealer to a light colored granite countertop. I watched the video at least 5 times and read the instruction booklet numerous times, so I believe I applied the product appropriately. However, it still gets water spots and other stains. I am very disappointed about this. 1. Should I reapply the SenGuard? If so, would I do it from the beginning of the instructions or should I should I just do Step 5 again? 2. Can I use a cleaner that says it seals as it cleans? 3. Do I need to use lambswool to reappy or can I use another material? Most likely you have not yet effectively sealed the countertop. Senguard forms permanent bonds and requires only one application, but one "application" means to the point the stone is effectively sealed and not just one "coat". The vast majority of granite countertop colors or varieties will only require one coat to effectively seal the surface. However, there are 2500+ colors, so it's difficult to account for the differences encountered with every color in the sealer instructions. You state you have a light-colored granite countertop. Well lighter colors tend to be more porous and some can be extremely porous (Kashmir is the most common of this sort) and far outside the norm when applying a granite sealer. Therefore, you may need 2 or 3 coats of the granite sealer before your granite countertop is actually "sealed". The way you determine if any stone is sealed effectively is to perform the water test for sealing granite countertops (see link above). The fact that water is still readily absorbing causing dark spots is an indicator that you haven't actually sealed the surface. So, perform the water test to get an idea of how absorbent the surface still is and apply the Senguard granite sealer accordingly. You do not need to re-clean the surface and you do not need to use the lamb's wool. Any cloth will do. Just start with the step where you apply the sealer to the cloth/surface. The "cleans and seals" product is a bit of an exaggeration. Such a product may help increase the effective life of a granite sealer, but the surface must be sealed in the first place. And such a product would have no benefit when used in conjuction with SenGuard since SenGuard does not degrade over time with use or cleaning like all other granite sealers do. The fact that standard/non-permanent sealers degrade is the reason a "cleans and seals" product exists. You are shooting for aborption times greater than 20 minutes. Remember no sealer absolutely prevents absorption. What granite countertop sealers do is dramatically increase the time it takes a liquid to absorb so you have more time to clean it up before it stains. The reason sealers are made this way is for the benefit of the stone. Permanent topical coatings that form a film over the stone can be harmful to the stone and they also make the stone look plastic and require more maintenance than the stone itself, so should not be used. Is the SenGuard granite sealer available locally for DIY, and how many sq'ft' does a kit cover? This information from your web site answered most of my questions except about the web site that sells DIY kits. Thanks. Well, I'm glad you found many answers on our website about SenGuard stone and granite sealer. We highly recommend this sealer. Best on the market using the most advanced chemical technology to form permanent bonds. SenGuard sealer is not available locally or in stores. For a long time it was only available as an upgrade on Sensa granite sold by Silestone. Our website... CountertopSpecialty.com is a top online consumer resource for granite and marble countertops and we thought the product was excellent recommending it to our clients and website viewers. Silestone then contacted us to provide a DIY kit for the SenGuard sealer. So, where can you buy it? Well, right here! Kind of reminds me of running around the house trying to find my hat only to discover it on top of my head! We do have several links on various pages to direct people to our online store with the products we recommend, but maybe we need a few more. So again, currently the only place you can buy SenGuard is through our website. click here to buy the SenGuard DIY Marble & Granite sealer. The page you go to after clicking the link will provide thorough information about SenGuard including coverage which is 50 to 200 square feet per bottle depending on how porous your stone is. You can purchase by clicking the "add to cart" button and check out as usual.